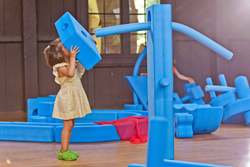 Parents and educators of The Magic City rejoice: Imagination Playground, LLC, creators of the revolutionary play space concept that encourages child-directed, unstructured free play, announced today it will feature their famed Big Blue Blocks in Miami as part of the company’s 2018 spring Learn & Play Tour. Imagination Playground’s 17-city Learn & Play Tour is part of the company’s larger mission to showcase the many benefits of child-directed play. Studies have shown that such play is influential in developing critical skills such math, logic, creativity, social/emotional development, communication, critical thinking and problem solving. Previous spring 2018 tour destinations have included Pasadena, Calif. and St. Paul, Minn.
Part of a partnership with several Museum and Science Centers across the nation, the next stop of Imagination Playground’s North American spring Learn & Play Tour will take place in Miami, 12 p.m. to 5 p.m. on March 10, and 11 a.m. to 5 p.m. on March 11, at Miami Children’s Museum. The event will bring together children and adults to enjoy free-play with the blocks. Educators and parents also will learn how the blocks can help to unleash creativity and build lasting connections. Educators are eligible to receive teaching credit for their attendance. Imagination Playground is on a mission to transform the lives of children, parents, educators, caregivers, researchers and leaders by uniting them in a community of advocates who believe in the importance of creative free play. Using Imagination Playground’s innovative big blue building blocks, kids will create, and collaborate for a fun, inspiring time. They will learn how to work together and how to let their imaginations run wild. Imagination Playground exists to help children take a break from structured and often solitary entertainment and enjoy the freedom of cooperative play. Children are not the only ones to benefit from Learn & Play. Parents attending the events will also be transformed and encouraged. They will experience nostalgia, but they will also gain a new appreciation for the creativity inherent in all children as they enjoy building and creating structures and creatures with Imagination Playground’s big blue blocks. It’ll even encourage parents to get down on the floor with their kids, join in on the fun, and get their own lesson in creative problem solving and democratic play. Imagination Playground creates unique, innovative playground equipment systems for use in schools, children’s museums, parks, daycare centers, camps and hospitals. The company’s patented blue blocks allow children to create play spaces, animals, robots, rocket ships or any other structure or object that kids can imagine. The Learn & Play Tour will visit 17 cities in North America, including San Francisco, Seattle, Chicago and New York. Beyond credit, educators will go home with a 70-piece Small Block Sample Pack. And families will receive a pop-out Mini Playground for attending. To RSVP for the Miami Learn & Play event, please visit https://form.jotform.com/80107560184148. For more information and a schedule of events, visit http://www.imaginationplayground.com/mission/learn-play-tour.html.